We’d love your help. Let us know what’s wrong with this preview of The Quest For the Kid by Adrienne Kress. To ask other readers questions about The Quest For the Kid, please sign up. 2016 saw the release of HATTER MADIGAN: Ghost in the H.A.T.B.O.X., an exciting collaboration with NY Times bestselling author Frank Beddor (set in the same world as his Looking Glass Wars YA books). And April 2017 she releases the first book in her ne Adrienne Kress is a Toronto born actor and author who loves to play make-believe. She also loves hot chocolate. And cheese. Not necessarily together. 2016 saw the release of HATTER MADIGAN: Ghost in the H.A.T.B.O.X., an exciting collaboration with NY Times bestselling author Frank Beddor (set in the same world as his Looking Glass Wars YA books). 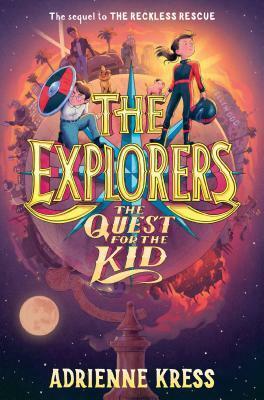 And April 2017 she releases the first book in her new Middle Grade series: THE EXPLORERS - The Door in the Alley (Delacorte, Random House). October 2016 her essay appeared alongside work by the likes of Margaret Atwood and Mariko Tamaki in the non-fiction anthology THE SECRET LOVES OF GEEK GIRLS (Dark Horse). She is also the author of two other children's novels: ALEX AND THE IRONIC GENTLEMAN and TIMOTHY AND THE DRAGON'S GATE (Scholastic). And also the YA novels, THE FRIDAY SOCIETY (Steampunk Adventure from Dial Penguin, 2012) and OUTCAST (a quirky YA paranormal romance from Diversion Books, 2013). Some more info about Adrienne: she is a theatre graduate of the Univeristy of Toronto and London Academy of Music and Dramatic Arts in the UK. Published around the world, ALEX was featured in the New York Post as a "Post Potter Pick," as well as on the CBS early show. It won the Heart of Hawick Children's Book Award in the UK and was nominated for the Red Cedar. The sequel, TIMOTHY, was nominated for the Audie, Red Cedar and Manitoba Young Readers Choice Awards, and was recently optioned for film. THE FRIDAY SOCIETY was nominated for a Quill Award, and has been optioned for television. DIE HALSUBERKOPFUNDKRAGENDRAMATISCHABENTEUERLICHE KATASTROPHENEXPEDITION DER ALEX MORNINGSIDE.